Oscar-winning actress Julia Roberts is putting her beachfront estate in Hawaii on the market for nearly $30 million, Pacific Business News has learned. The two-acre property in Hanalei on Kauai’s North Shore, which has seven bedrooms and four full bathrooms in a 3,792-square-foot home, was once owned by Hans Peter Faye, a prominent Garden Isle sugar plantation manager. 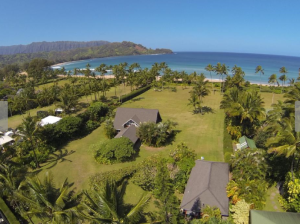 The property, which has about 200 feet of beach frontage on world-famous Hanalei Bay, is permitted to include an expanded building up to 9,000 square feet, allowing for more structures and even a pool, according to the sales listing. Roberts, who rose to fame starring with Richard Gere in the 1989 movie “Pretty Woman,” reportedly purchased the “Faye Estate” several years ago for nearly $14 million. Kauai’s North Shore, which saw its median price eclipse the $1 million mark in February, has been quite a draw for celebrities. Celebrity martial artist actor Chuck Norris, Facebook’s Mark Zuckerberg and Oakley founder James Jannard are the latest celebrities to buy property in the area. Additionally, a partner in a hedge fund recently purchased several Hanalei properties for close to $50 million. Other celebrities with ties to Kauai’s North Shore include Honolulu-born Bette Midler, Pierce Brosnan and Ben Stiller.